10+ Clever Science Experiments With Water You Can Try Right NOW! Get your kinds interested in science with ten science experiments with water that you can try right now. They are easy to do and kids go crazy for them! Science experiments with water are perfect for some scientific learning! Kids love getting wet and water is fascinating to them. These simple science experiments will hold their attention and give you all something interesting to do on hot summer days. Here are ten awesome, and easy, science experiments for you and your kids to do with water. You can give them all a try as I selected different ideas and ways of learning. They are engaging and memorable. Do the experiments but, by all means, let them actually enjoy the experience and play! That is how science learning happens. 1. 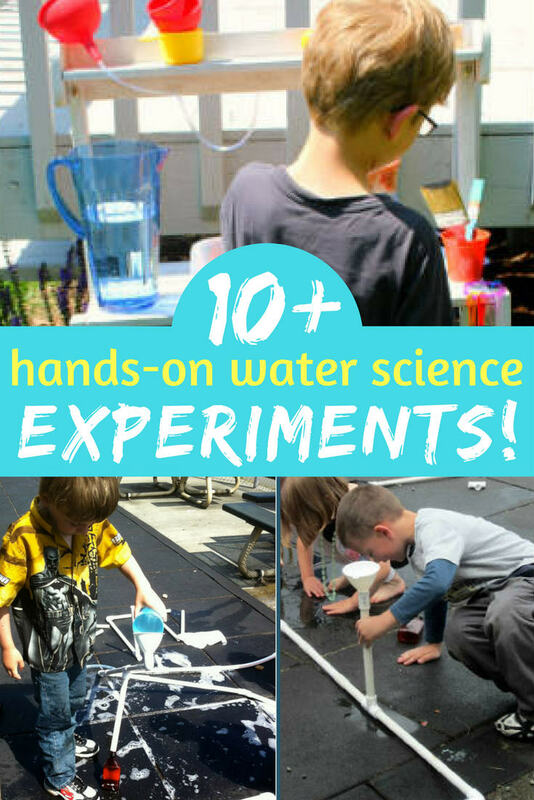 This easy water science post offers several science experiments with water that are all done with everyday household objects (love that!) Includes: sink and float, see if you can float an egg, bubble of air in a cup etc. 2. Experimenting with water displacement is a classic. Everyone likes it and you can use all types of things to play around with this concept. Take a look at what they did but be sure to provide a lot of different containers and a lot of items to put into them for even more fun. 3. Run a trickle of water, take one balloon, create some static electricity and see what happens to the water stream. If you are looking for a simple water experiment, this is the one for you. 4. You have to do this if you have never done it before! If you have done it before – do it again. 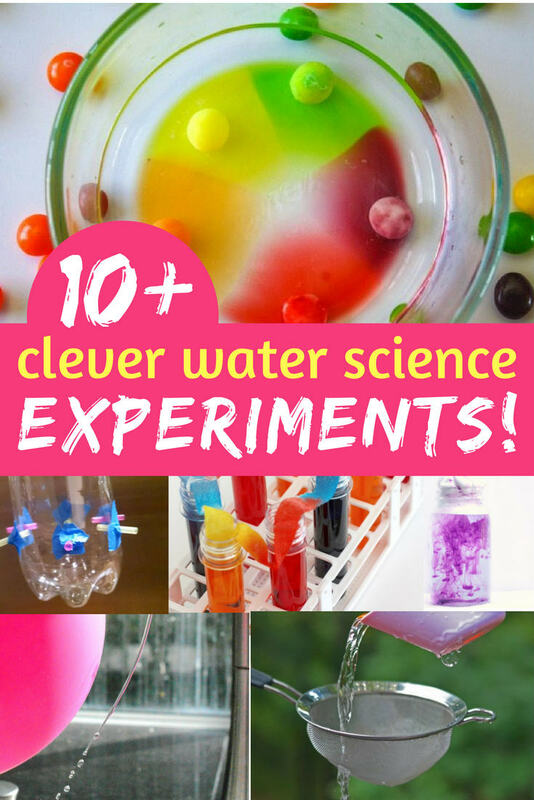 This is a seriously cool water science experiment that kids never get tired of and it is sooo easy. Be sure to plan on getting wet and by that I mean go ahead and try the experiment and then have a lot of fun with that hole-filled bag. Need more ideas? Try this EASY Science Experiments Book! Great Reviews!! 5. The walking water experiment is easy to do. Kids really love this one because if it very colorful and visual! 6. Younger scientists will enjoy making a rain cloud in a jar, try this version for easy directions and a good explanation of what is happening. 8. Be sure to take a close look at their neat water setup. I really like to give kids a place to work so if you can do something similar to this, go for it. Included here are a couple of experiments that they did. One includes combining floating and sinking items to see what happens and another has to do with measuring the amount of water objects will hold. 9. Try an experiment that will help you learn how a hydro-electric plant works! Cool, right?! You only need simple supplies so don’t worry. Go here to check it out. 1o. This physics water experiment with pvc pipe is great. I mean GREAT! It has open-ended elements which is why I like it so much. Take some pvc pipe, connectors, and water. Add in curiosity and you have a wonderful project. Be sure to try this one. It is fun for kids of all ages. These experiments ought to keep everyone busy learning. Parents, don’t forget to follow the how to have fun with science experiments “rules” for maximum enjoyment! 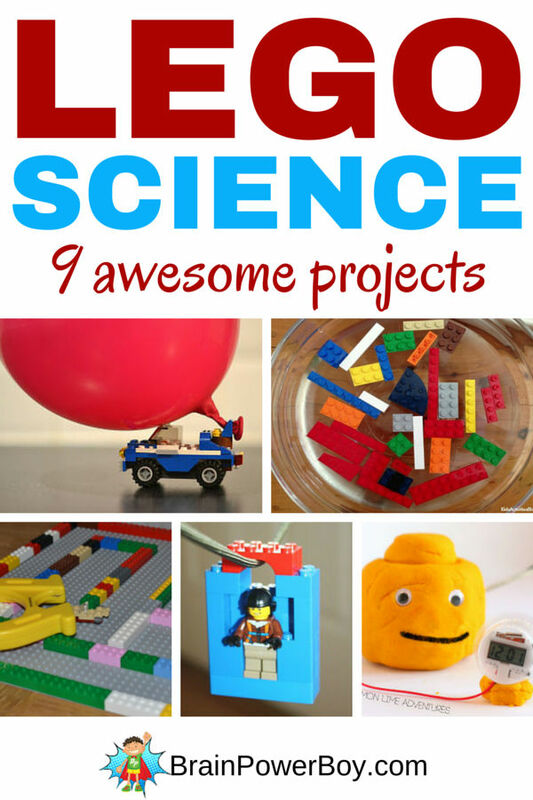 LEGO Learning: Awesome LEGO Science Projects!